Lucerne is situated in the geographic heart of Switzerland and can easily be reached from several other destinations. The major Swiss cities of Zurich, Bern and Basel are all just an hour’s train ride away. 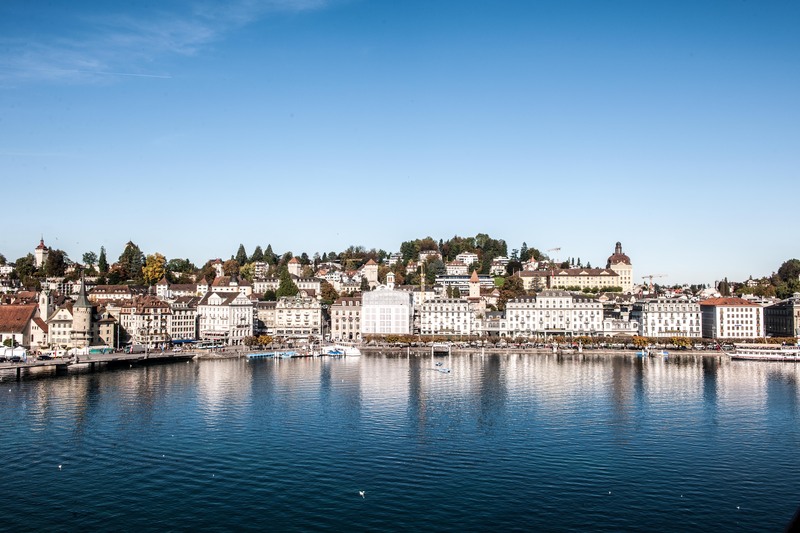 For visitors flying into Switzerland, the most direct way to reach Lucerne is through Switzerland’s largest airport: Zurich Airport (ZRH) is perfectly organized to assure smooth travel. Shortly after arriving, you’ll already find yourself sitting comfortably inside the train. Direct trains from the airport to Lucerne leave every hour. You can purchase your train ticket using the blue ticket machines located near the train tracks. You can pay with your credit card. A first class ticket to Lucerne costs CHF 49. In Switzerland, the second class, too, allows for comfortable travel. Tickets from the airport to Lucerne cost CHF 28 per person. Or you can rent a car and explore not only Lucerne, but also the surrounding area. The train ride from Geneva Airport (GVA) to Lucerne takes about 3 hours. The journey winds along Lake Geneva and through vineyards that are a UNESCO World Heritage site. It takes a little longer than if you arrive at the Zurich Airport – but views like these might make it worth the while. Again: direct trains to Lucerne leave from the train station located inside the Geneva Airport every hour. A first class ticket to Lucerne costs CHF 140. A second class ticket to Lucerne costs CHF 80. Lucerne’s train station sits on the lakeshore, right next to the world famous Culture and Convention Center by Jean Nouvel. And only a 10 minutes’ walk away, you’ll find ochs and junior. However, as the path leads along the lakeshore, and offers gorgeous views on the city, the lake and even the Alps, you may just decide to take a little longer to get to reach our workspace located at Zürichstrasse 49. If you prefer to take the bus, head to the bus platform all the way to your left after exiting the train station. Buy a ticket at the ticket machine (short trip, CHF 2.25) and wait for Bus No. 1, direction Maihof. Or you could board Bus Nr. 19 direction Kantonsspital-Friedental, which leaves a little further to the right. Either way, you’ll hop off at the stop Wesemlinrain – and right across the street you’ll see our workshop located at Zürichstrasse 49. On the same street as our workshop, Zürichstrasse, you’ll find a parking garage (“City Parking”). It offers plenty of parking spaces at just about any hour of the day. In Switzerland, each of the four seasons is distinct and has its own charms. In spring, the cherry trees bloom on Mount Rigi. In summer, warm temperatures and blues skies make for perfect holiday weather and the lake beckons. The Alps are close and make for beautiful day trips. Autumn brings new flavors in the form of seasonal foods that you can find at Lucerne’s weekly markets. And in winter, we always hope for snow. Lucerne offers not only a multitude of attractions, it is also the perfect starting point for day trips to other Swiss destinations: Zurich, Switzerland’s largest and most urban city, is just an hour away. So is Bern, Switzerland’s capital, with its lovely medieval city center, or Basel with its world famous museums. Contact us with any questions you might have. We are happy to provide travel tips and ideas that are tailored to your needs and interests. And we really know Lucerne and the surrounding area!